Dr. Pol Forn-Díaz has been awarded the MIT International Science and Technology Initiative Seed Fund, together with MIT Professor William D. Oliver and Dr. Simon Gustavsson. The 20,000 USD grant is awarded by the MIT-Spain – “La Caixa” Foundation. The award will strengthen the already existing collaboration between the BSC and MIT groups in their project to build a superconducting quantum processor. The Barcelona Supercomputing Center celebrates its special day when the winter holiday period approaches. This year the event was marked by the recent news of the award to BSC of the project EuroHPC to coordinate the endeavor of producing European-made computer chips, and become a sovereign chip producer. More extended coverage of the news here (in Spanish). During the presentation by BSC director Mateo Valero and associate director Josep Martorell, an overview of the year 2017 was given, with special emphasis on the start of MareNostrum 4. As a highlight of 2017, the creation of our group QUANTIC had its moment, particularly since some are already wondering when will BSC host a quantum computer. 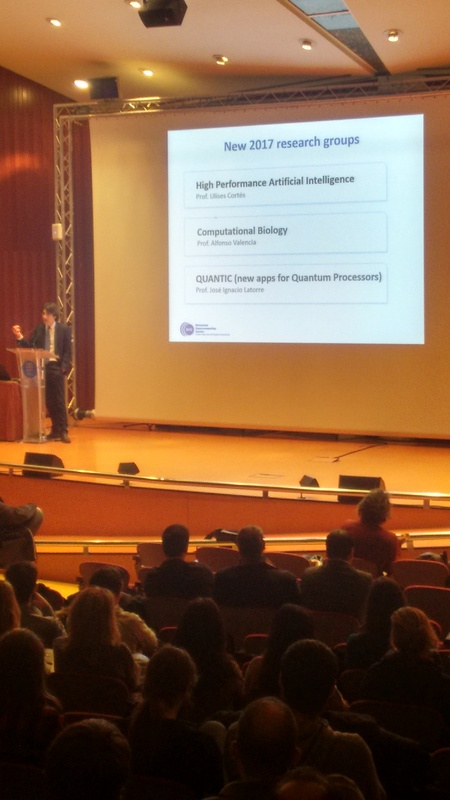 Josep Martorell, BSC vice director, highlighting the creation of Quantic Group. This message is to officially launch our group website at BSC.